I have 2 Kraken x62's, one on my CPU and one on my GPU (via Kraken g12). When I first booted after having both plugged in they both showed up in the CAM software, but after a firmware update of the GPU X62, only one of them shows in CAM. I know the GPU x62 is working as my temps are much improved but I have no way to control the aio settings or temp control for the gpu? I have 2x Grid+ V3. 50% of the time they both work perfectly and follow their fan curves and so on. 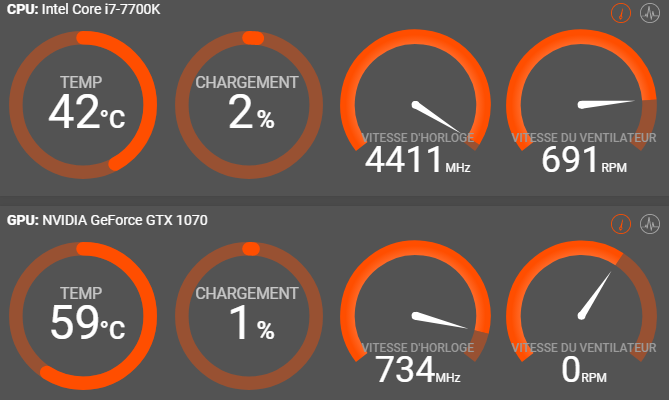 The other 50% of the time, one fan decides to run much faster than the others and stays at that fixed RPM. Messing with CAM doesn't influence this one fan at all. The other fans work, from what I can see, perfectly. They are all Corsair ML Pro 120 and all have an individual header on the Grid+ V3. The solve is to turn off the PC and then reboot it. The single fan runs fast during the reboot but as CAM software loads and the fan RPM up for their test, all the fans spin back down to normal including the single one that is acting rogue. Hey guys - NZXT lover here! I was just wondering if there were any more "profiles" for the "Game" setting under CAM's RGB Smart Devices available. I see that many people have asked for it over the years, (and love the CS:GO one as it is!) and that there have been promises for new profiles, although I wasn't sure if there have been any since the peoples' asking years ago. Thank you! So no matter what program or game I am running CAM says my gpu load iis zero %. Is there anything i can do to fix this? It was working properly until a few days ago. nothing about my system has changed. Nearly every time I start my PC and CAM starts up, the software disclaimer "Agree" button does not work. "Disagree" works just fine, and starts software in guest mode. If I log in a 2nd time, it usually then lets me press "Agree", but there have been times I've had to press "Disagree" and then log in again up to 3 times either before it works or I give up. Also -- why the hell do I have to agree to the software **every freaking time** I start it? Why can't I just agree once, and then y'all can assume I agree in perpetuity or until you do a significant update? Cannot utilize my rgb lighting on my M22. No lighting AT ALL! Okay, fix it. Tried installing and reinstalling doesn't detect my kraken. Can't fix the lighting or alter my rgb options. You had it running perfectly. BY THE WAY!, WHEN MY OLD CAM WENT OBSOLETE IT ALTERED ALL OF MY OVERCLOCKING OPTIONS TO INCOMPATIBLE SETTINGS AND VOIDED MY BOOT UP! I HAD TO RECONFIGURE EVERYTHING IN MY BIOS TO MAKE SURE THAT IT WOULD RUN PERFECTLY AND RESET MY OC OPTIONS TO NATIVE IN ORDER TO EVEN BOOT MY PC! THEN ON TOP OF THAT! IT SCREWED WITH MY FAN SETTINGS AND MY STUPID BIOS DIDNT EVEN KNOW I WAS USING LIQUID COOLING! In the future... you should release updates via the software I am already using in order to avoid problems like this from arising. I would have come after you for 3 grand if anything had gone wrong with my hardware, took me a while to figure out what caused it, till I figured out that my stupid cam software has been obsolete for months! AUTO UPDATE!?!?! HELLO!?!?!?! how to recover deleted emails from Google! Although email looks ancient for communicating with your dear ones but Google is one of the leading email service provider as it is used for sending and receiving email over the Internet. 1. Email is also not in default folder then you will have to use recovery option. 2. For recovery your deleted mail, you need to check the Backup store of your email. 3. Here you have to enter your alternate email id. If you are getting any trouble while using above steps then you may contact to Google. You will get major help from Google technician for resolving your query. They will provide you best customer support by providing immediate solution to get rid of any problem. They will provide you uncomplicated solution for any problem related to Google. There are some instances when a Yahoo account user forgets the password of their Yahoo account and even don't have access to the recovery email address. In that case, recovering Yahoo account password becomes a trouble and to reset the password a user search around.